The Samuel Lewis Estate ball park mural was designed through workshops and drop-in sessions with around 20 young people from the estate, aged between 5 and 16. A mural was required within the games area on a well-kept and respected residential housing estate in South East London. To ensure that the final piece reflected the interests of the young people that use the area, workshops with professional graffiti artists were held to encourage the young people to work creatively with ideas that would form the foundation of the mural design. The ideas generated in the workshops were developed into a coherent sketch that complemented the site and other existing mural work. Signal used a layering process to develop the mural; the wall was filled and primed, then a bold sequence of base colours applied. The young people were encouraged to paint ‘freestyle’ on the base colours with a complimentary paint palette. 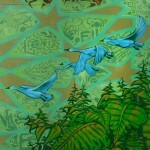 The freestyle graffiti was then used as a textured backdrop to the main mural design. The design was outlined and participants then helped work on the final mural. The work was professionally finished leaving elements of the freestyle graffiti showing through. “It was a delight to work with the artists of Signal project. They had a great rapport with the young people and brought in lots of material to engage them in. The artists combined high quality professionalism while being patient and open with the young people and were able to bring out lovely creative results with them.